Best Saw palmetto extract contains plant sterols, free fatty alcohols, monoglycerides and free fatty acids but the free fatty acids and sterols are the primary ingredients that provides the desired effect. Best Saw palmetto extract 85% to 95% fatty acids and plant sterols, the herb's key active ingredients. Extraction is done using super-critical carbon dioxide and thus the finished product is free of solvent residues. Doctor’s Best Saw Palmetto Extract provides effective prostate support. * It contains pure Saw palmetto extract guaranteed to supply 85% to 95% fatty acids and beneficial plant sterols, which are the herb's key active ingredients. Extraction is done using super-critical carbon dioxide, the finished product is free of solvent residues. 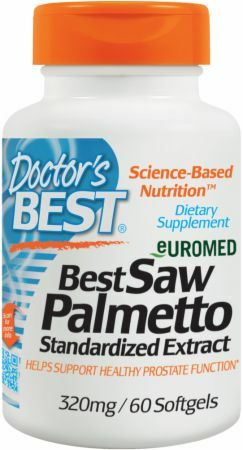 Directions For Best Saw Palmetto: Suggested Adult Use: Take 1 or more softgels daily with or without food.